We just stumbled upon the Superstition Mountain series last year and absolutely loved it! I knew I had to include it in our alphabet round- up of favorite books and authors! What's not to love? This three book series focuses on treasure, mysteries, a ghost town, and an old gold mine. Set in a small town the kids begin to suspect someone (or a few someones) is trying to stop the from uncovering the mountain's mysteries. 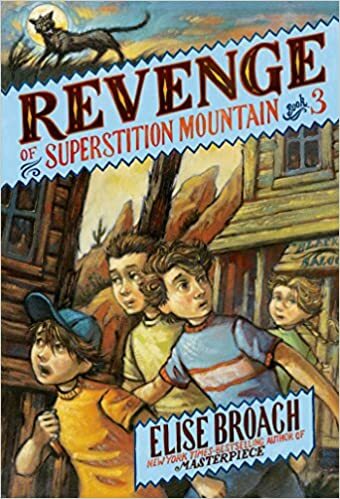 In book one of the series (Missing on Superstition Mountain) the three Barker boys are new to Arizona; having moved into their Great Uncle Hank's house. They have been warned not to go up the mountain but when their cat goes missing they have no choice but to go hunting for her. Together with their new neighbor Delilah the boys uncover a few other mysteries about the mountain. 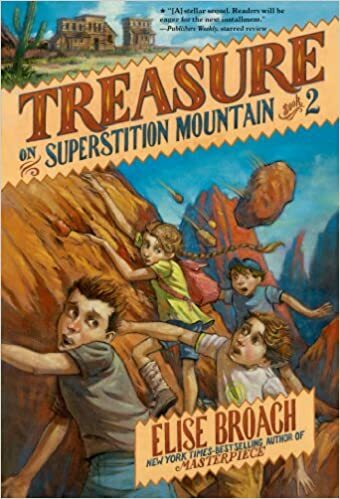 In book 2, Treasure on Superstition Mountain, the Barker boys and Delilah go searching for the Lost Dutchman's Mine. They learn even more about the dangers of the mountain when they are nearly killed in an avalanche. In book 3, Revenge of Superstition Mountain, Delilah and the Barker boys try one last time to uncover the mountain's secrets. Is the librarian the ghost of the old Julia Thomas? Does their cat have secret powers? Did the avalanche close off the mine entrance? Who keeps trying to hurt or kill them and why? What a great adventure series. I love this series of articles, too. They are a lot of fun! We hadn't heard of them either but quickly fell in love with them.